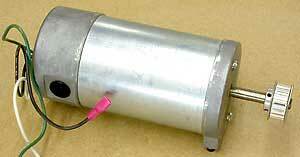 There are no markings on this motor and the 120 VDC figure was derived from the circuit it was connected to, but it also operates nicely on as little as 12 Volts. 6.5" L x 3-3/8" Dia. 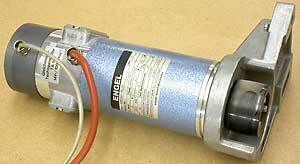 – 3/8" shaft extends 2"
with a 13.8 mV / RPM Tachogenerator. I believe this motor is from a large computer Winchester type disk drive. 11.5" L x 3.25" Dia.